Two more pests deserve our attention over the next month. 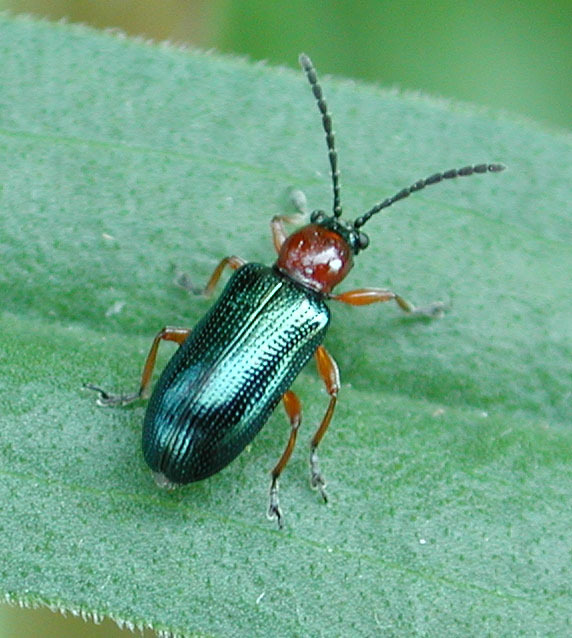 Cereal leaf beetle (CLB) is starting to show up in some fields in Ontario. Levels are still low but both adults, eggs and/or larvae are being found by scouts at various locations during routine scouting trips. A few locations tend to experience a higher frequency of infestations including fields near Dresden, Bolton, Stayner, Seaforth, and Clinton. But this does not mean that other fields in Ontario are not at risk. 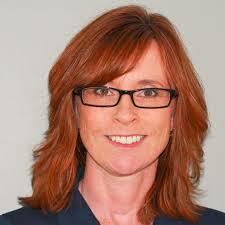 Susan Gowan, a crop consultant in Haldimand, for example. is finding CLB more easily in that county over the last few weeks than in previous years. Nothing of concern yet, but it does indicate that other areas not known for being a CLB hot spot should be scouted. A detailed post on CLB from 2016, including scouting and thresholds can be found here. True armyworm is also expected to be a higher risk this year, given very early and higher than normal trap catches this spring, both here and in neighbouring states. Moths prefer to lay their eggs on grassy vegetation, including grassy weed species, cereals, mixed forages and grassy species of cover crops. Larvae hatch from the eggs and feed at night for approximately a month. 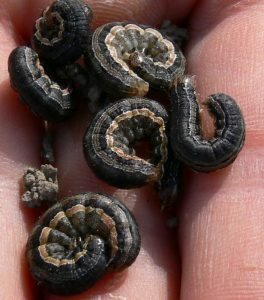 Full grown true armyworm are 4 cm (1 1⁄2 in.) long and are dull-green to brown in colour. No matter what colour they are, they always have white-bordered stripes running laterally along the body and to be true armyworm larvae, they must have dark diagonal bands at the top of each abdominal chubby proleg. There are two to three generations but the first generation is the most problematic here in Ontario. Most feeding activity is done in June to early July but can start as early as late May. In corn, larvae strip the leaf margins, but as they grow in size and numbers, can leave only the midribs left on the plants. As long as the growing point of the plant is not damaged, the corn plant will be able to recover from moderate feeding. 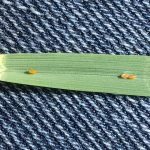 In cereals and mixed forages, feeding begins on the leaf margins, but larvae may quickly move up the plant to feed on the kernels and awns or clip the wheat, timothy or other small grains heads completely off of the stem. Clipped heads can be found on the soil surface and can impact yield if taking place in many areas of the field. The best time to scout for true armyworm is shortly after dusk when larvae are actively feeding. In corn, examine 20 plants in five areas in the field (100 plants total). In cereals and mixed forages, examine 10 areas of the field, assessing the number of larvae per 30 cm2 (1 ft2). Pay particular attention to the border area directly adjacent to other grassy host crops. 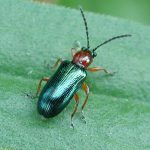 During the day, if it is cloudy and overcast, you might be lucky enough to see larvae in the whorl, leaf axil, or on the head of the plant but on sunny days, they will be down on the ground among the crop debris or under soil clods. Brown frass may also be present on the plants and on the soil surface. Keep on eye on Field Crop News for scouting alerts and refer to the Pest Manager app and OMAFRA Publication 812, Field Crop Protection Guide for insecticide options. Send me any reports of true armyworm sightings @TraceyBaute. Thresholds and Management Options will be covered in more detail in an upcoming blog.